Every year at the end summer break, students no matter what the age are busy running around gathering up their school supplies, going to Open House to meet their teachers, and double-checking their closets to be sure they have the right outfits to make an impression with their peers. And what are the teachers doing at this time? They’re just as busy picking up their schedules, reviewing the school calendar, double-checking the standards and benchmarks of the school curriculum, and decorating their classrooms for the first day of school. Most effective educators turn to data-driven research when creating a plan of action. In John Hattie’s book, Visable Learning, A Synthesis of Over 800 Meta-analysis Relating to Achievement, he synthesizes over 800 meta-analyses. Therefore, what indicators make the greatest impact on student achievement? Scores ranged from -0.51 to 1.30. 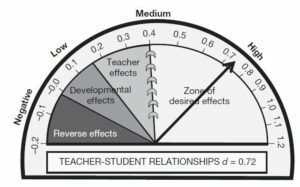 In his summary of Hattie’s book, Gerry Miller states, “An effect size of d=1.0 indicates an increase of one standard deviation on the student achievement. A one standard deviation increase is typically associated with advancing a student’s achievement by 2 to 3 years or improving the rate of learning by 50%. Research shows that these can be expected to have an average effect size of 0.4 (the ‘hinge point’).” Anything below 0.40 won’t have much of an impact on student achievement, while anything above 0.40 will have a direct correlation to student success (Miller, G. p.1). The beginning of the school year is time to set the right climate, to begin to develop positive relationships between the teacher and the students. As Kirke Olson stated in his book, The Invisible Classroom: Relationships, Neuroscience, and Mindfulness in School, it’s time to create a school culture that supports excellence (Olson, p. 3). So why is that important and how does one do that? Olson describes these relationships between the teachers and the students and the students’ relationship to one another, as “the invisible classroom—a collection of continuously active neurological and human connections that have an immense effect on learning but little to do with the actual content of the lesson” (Olson, p.64). Students should learn how the brain functions and how it learns best. The teacher as well as the students need to also understand emotional intelligence and how it plays such an important role in the classroom (Goleman, 2001). From the moment we’re born, the human brain is wired to best learn within the context of a loving relationship. “When the humanity is removed from education, so is much of its effectiveness” (Olson, p. 64). In the book, Humanizing the Education Machine, the authors discuss how we have taken the personal relationship building attributes out of teaching. “The Education Machine only operates with a mandate and a formula; it cannot care or even think” (Miller, Latham, Cahill, p. 217). 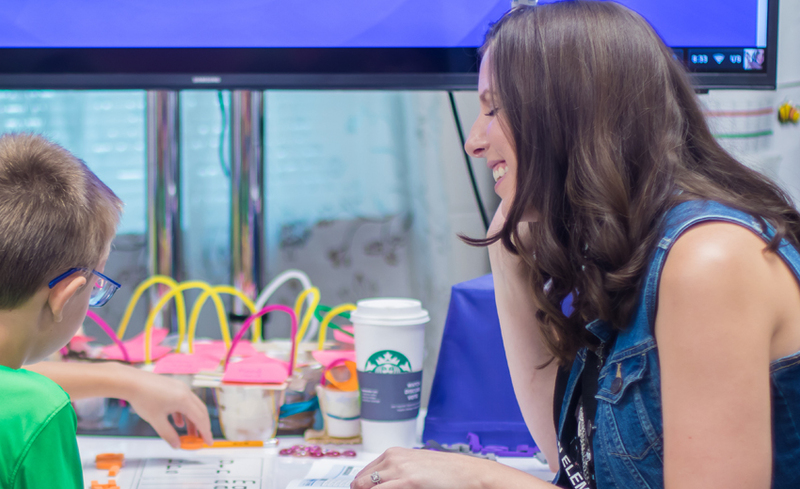 As educators, we have always inspired a love for learning. So what action steps can teachers do now to planfor a new school year? Hattie, J. (2009). Visable learning, A synthesis of over 800 meta-analysis relating to achievement. London: Routledge. Miller, G. (2009). Summary of visible learning by John Hattie. University of Auckland, New Zealand. University of Auckland, New Zealand. Miller, R., Latham, B., & & Cahill, B. (2017). Humanizing the education machine. Hoboken, NJ: John Wiley & Sons, Inc.
Olson, Kirke (2014-07-27T23:58:59). The Invisible Classroom: Relationships, Neuroscience & Mindfulness in School (The Norton Series on the Social Neuroscience of Education) (Kindle Locations 64-65). W. W. Norton & Company. Kindle Edition.